New York: William Doyle Galleries, 2006. 131 pp. 386 lots. 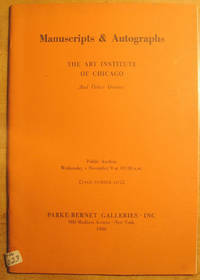 Over 300 illustrations, about one-quarter of the 83 rare books and mss. lots are illustrated, the remaining lots, old master, modern and contemporary prints are all illustrated. All illustrations color. J.T. Arms, M. Avery, F.W. Benson, T. Benton, G. Braque, A. Briscoe, A. Calder, C. Capps, L. Carrington, M. Cassatt, M. Chagall, S. Chamberlain, A. Dehn, J. Dine, K. Eby, F.S. Haden, Y. Hamaguchi, C. Hassam, A. Hirschfeld, L. Icart, L. Kasimir, A. Katz, M. Lewis, M. Marini, R. Marsh, C. Meryon, J. Miro, T. Moran, R. Motherwell, J. Pennell, P. Picasso, R. Rauschenberg, Man Ray, P-A. Renoir, C. Rungius, J. Sloan, B.M. Spruance, S. Wengenroth, J.A.M. Whistler, G. Wood, H. Ziegler, H. Zille, F. Zuniga are each represented by more than one lot. Many more artists. 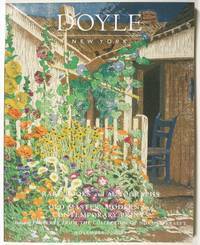 Cover illustrated by Hoosier Garden by Gustave Baumann.. Wraps. Fine. 4to - over 9¾" - 12" tall. New York: Parke-Bernet, 1966. 53 pp. 177 lots. Approx. 15 b&w illus. Prices realized laid in. Small sticker at bottom of spine is becoming detached. 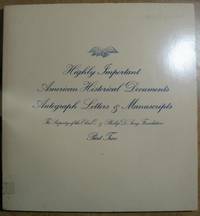 Includes American Historical Manuscripts, Illuminated Manuscripts, Important Hemingway Letters, Letters of American Artists. Frontis. illus. is manuscript book of hours on vellum, 100 leaves, Netherlands 15th century which sold for $1,750.. Wraps. Very Good. 4to - over 9¾" - 12" tall. London: Sotheby's London, 2005. 166 pp. 246 lots. Including lots 1-48: Continental Books and manuscripts (including science and medicine): Antoine d'Abbadie; Petrus Apianus and Bartholomaeus Amantius; Francisco Arceo; Aristotle (Venice, 1536); Boccaccio (Toledo, 1511); Sebastian Brant (Basel, 1498); Thomas Bradwardine, Archbishop of Canterbury (Paris, 1495) (sold for 23,400 GBP); Giovanni Antonio Dosio, (Florence, 1569); Alexandre Dumas Pere, 9 ALS; Albert Einstein Autograph Manuscripts; Freud, ALS; Louis XVI, ALS; Marie Antoinette, document signed; Proust, ALS; Rilke; Andreas Salome; Soupalt. Lots 59-82: Natural History: Ulisse Aldrovandi; Basilius Besler; Georges Louis Marie Leclerc Buffon; Henry Eeles Dresser; Henri Louis Duhamel du Monceau; Charles Lemaire; Francois Levaillant; Henry Leonard Meyer; Nathaniel Sendel; Antonio Tempesta; Lots 83-91: British Isles: Sir Robert Atkyns, The Ancient and present state of Glocestershiere; William Camden, Britain, or a chorographicall description of the most flourishing kindomes, England, Scotland, and Ireland (London, 1610). Lots 92-101: Atlases: Samuel Augustus Mitchell, A new univeral atlas. Philadelphia 1848. Lots 102-112: Europe: Sir William Hamilton, Campi Phlegraei. Observations on the volcanos of the two Sicilies; Giovanni Battista Piranesi, Opera (15 workd in 13 volumes, which sold for 176,000 GBP. Lots 113-172: Near and Middle East: Domingo Badia y Leblich; Henri Bechard; Francis Rawdon Chesney; Edward Dodwell. Lots 173-188: The Americas. Lots 189-192: Voyages. Lot 193: Africa. Lots 194-198: Asia. Lots 199-201: Polar. Lot 202: Australasia. Lots 203-246: Maps: Nova totius Americae tabula. Amsterdam: Pieter Schenk II., [c. 1710], which sold for 40,800 GBP.. Wraps. Near Fine. 4to - over 9¾" - 12" tall.